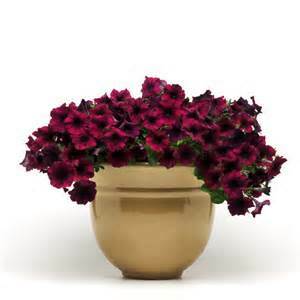 Petunias come in a variety of colors, growth habits, i.e. doubles, trailing, mounding, Waves, Supertunias, Grandifloras, and spreading. We have broken them down into their growth habits. This will help you to determine which Petunia is best for you. Petunias like to be planted in full sun with the exception of the Glow series that is featured in the trailing section. The Glow series can take partial to full shade. The first petunia bred for shade. Petunias are fairly hardy in our area taking light frosts and they keep going. Deadheading the flowers will encourage more blooms however the Supertunia series by Proven Winners are lower maintenance and are somewhat self cleaning. Grandiflora Petunias have large, single showy flowers and this series has a larger growth habit. Plant in full sun. This go well as a Filler in larger baskets or containers or as a stand alone plant in its own basket or container. Daddy Blue Grandiflora Petunia will grow from 10" to 18" tall and 12" to 18" wide. ​Red Grandiflora Petunia will grow from 10" to 12" tall and 12" to 14" wide. 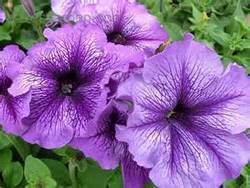 Sugar Daddy Petunia will grow from 10" to 12" tall and just as wide. 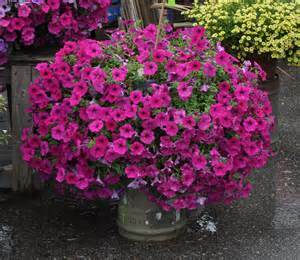 Mounding Petunias can be used in both stand alone or in combination with other plantings as a Filler. Plant in full sun. ​Moonlight Eclipse Petunia is another very unique variety with blue centers and outer white with a hint of lime green edged flowers. Use ​Moonlight Eclipse Petunia as a Filler or a Spiller. It will grow from 12" to 14" tall and spread about 13" to 15" wide. Definitely another fun flower to grow! Spreading Petunias include the varieties listed below plus Wave Petunias. Besides spreading wider than mounding petunias, these will tend to mound and spread. Their heights and widths vary. Plant in full sun in baskets, containers, or they make great bedding plants with explosions of color lasting all summer. Use these as Fillers and Spillers in baskets and containers. Wave Purple Classic Petunia has rich purple blossoms with a darker throat. It will grow from 5" to 7" tall and a whopping 36" to 48" wide. Shock Wave Denim Petunia are a rich, bold dark blue-purple, blue-lavender, and silver. This variety is an early bloomer. They will grow to a height of 8" to 10" tall and will spread from 12" to 36" in width. Easy Wave Petunias are a classic petunia favored by many gardeners. They have large blossoms that cover the plant from spring to early fall. They will grow from 8" to 12" tall and 12" to 36" wide. Use as a Filler or Spiller in baskets and containers. They are widely used in baskets, containers, and the landscape forming a spreading mound of color. Easy Wave Burgundy Red Petunia is slightly more mounding than the other Easy Wave Petunias. It will grow from 6" to 12" tall and 12" to 39" wide. Easy Wave Burgundy Velour Petunia is slightly more mounding than the other Easy Wave Petunias. It will grow from 6" to 12" tall and 12" to 39" wide. 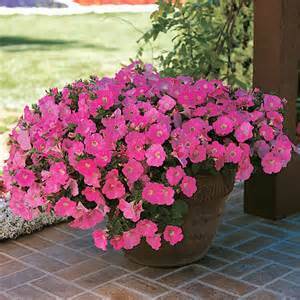 Supertunias are Proven Winner annuals that are low maintenance, sturdy, and tough plants. They are widely known as reliable and consistent. Supertunias will cascade from in baskets and containers providing season long color. Use them in annual planting beds too! Supertunias are self cleaning, they will attract butterflies and hummingbirds, and are drought tolerant once they are established. Use Supertunias as Fillers and Spillers. Mini Blue Supertunia This annual is a ‘Proven Winners’ plant. Mini Blue Supertunia has deep blue flowers and will grow from 6" to 10" tall and cascade from 24" to 48". Vista Silverberry Supertunia This annual is a ‘Proven Winners’ plant. Vista Silverberry Supertunia has silvery to light shade of pink flowers with darker pink centers and will grow from 16" to 20" tall and cascade from 20" to 24". Lavender Skies Supertunia This annual is a ‘Proven Winners’ plant. Lavender Skies Supertunia has lavender flowers and will grow from 6" to 10" tall and cascade from 24" to 48". 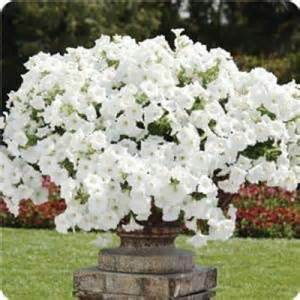 Mini White Supertunia has pure white flowers and will grow from 6" to 10" tall and cascade from 24" to 48". Royal Velvet Supertunia This annual is a ‘Proven Winners’ plant. Royal Velvet Supertunia has dark purple flowers and will grow from 6" to 10" tall and cascade from 24" to 48". Mini White Supertunia This annual is a ‘Proven Winners’ plant. ​Mini White Supertunia has white flowers and will grow from 6" to 10" tall and cascade from 24" to 48".